Miller Website Development: From wireframes and designs, to content development and QA, we helped this Bay Area law group deliver an online experience that reflected their unique company by being anything but business as usual. Miller Brand Development: Brand positioning and tone of voice? No problem. Logo and tag line development? We got this. Print and digital design standards? Done and done. 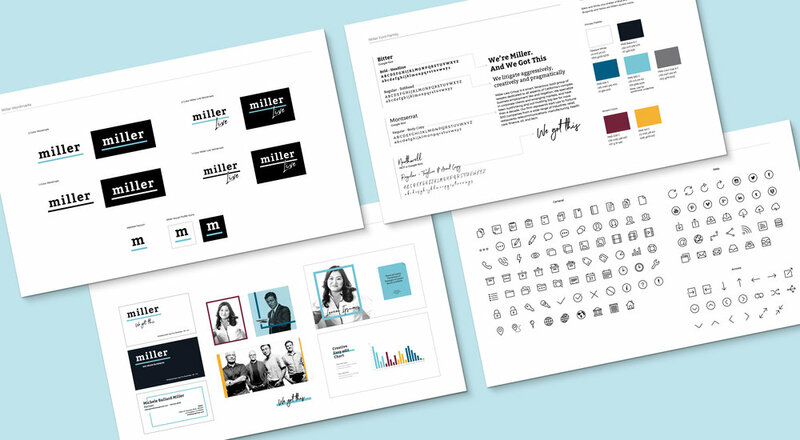 In just two months, we helped Miller define and launch their new brand. Miller Identity System: Our business card and letterhead designs were inspired by Miller’s bold, yet pragmatic, approach to employment law. Miller PowerPoint Template: From client presentations to monthly webinars, our multi-purpose presentation template features mix and match slides that are highly customizable and easy to edit.